May and I had just returned from our annual holiday; this year (2007) it had been Sicily. There was a message from Rob Hoole on the answer machine asking me to ring him which I did the following day. Rob told me he had received a request from a lady who was making a documentary for the National Geographic's TV series called “Monster Move”. The lady was enquiring if he knew anyone who had been involved in the recovery of the “Diocletian Gate” back in the seventies. He gave me the name of the lady in question and where I could contact her which I did the following day. The lady was called Leesa Rumley and she asked me if I was the chap who had led the team in the recovery of the Gate back in 1976. After I had answered in the affirmative, she then asked if she or one of her colleagues could call on me at my home. I, being the shy type of course, said “Yes”. Three days later a young man arrived with a camcorder and, to keep the story short, Leesa rang me up afterwards to ask if I would be interested in returning to Egypt for a few days to participate in the documentary. I jumped at the offer and a short while later Leesa again contacted me regarding the intended dates. Arriving in Cairo I was met by a travel rep and driven to the “Novotel” hotel just outside the airport. Early the following morning I was picked up and taken to the airport for my flight to Aswan. I arrived there in the afternoon and, much to my surprise, was taken to the “New Cataract Hotel” which had been my old abode 32 years previously - for six months! It was like returning home! I met Leesa, and the rest of the film crew that evening when I formed the immediate opinion that I was in the midst of a bunch of happy professionals. 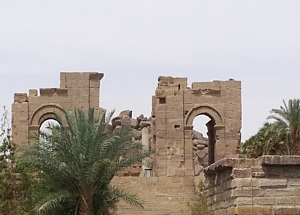 Work started early the following morning on the new site of Philae and the Diocletian Gate. My first sighting of the gate 32 years previously had been by touch underwater. It had also been 80% buried in mud but I soon recognized it when the small boat in which we were embarked got within sight of it. It was exactly as portrayed in early, above water photographs, shown to me before starting the recovery (which was a relief as it had been re-erected in accordance with my drawings of 32 years previously) and it was the right way up! The Italian engineers and surveyors had done a marvellous job of producing an exact replica of Philae Island; they had even added a few refinements for the benefit of the tourist – a modern, public convenience, with hand basins and flush heads! 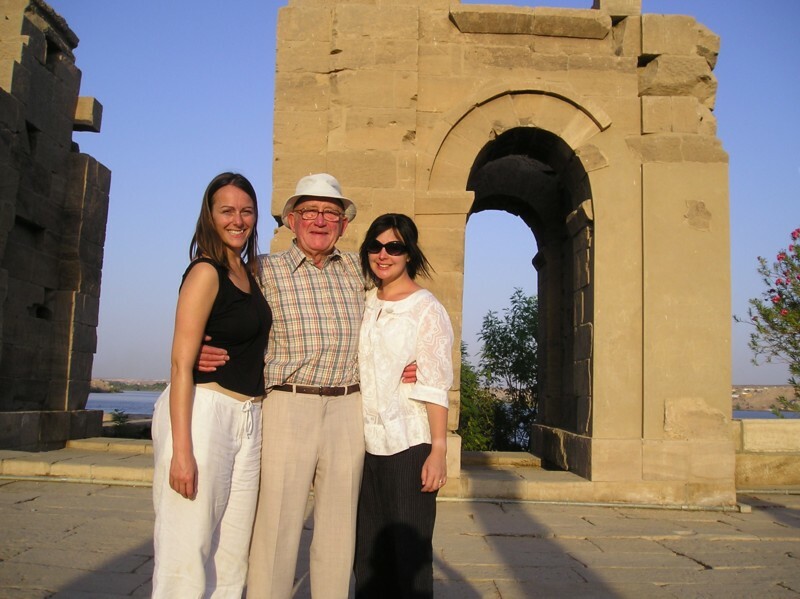 The whole island had been manufactured with the tourist in mind with, as well as the gate, all the other monuments that had been on the original Island of Philae. There was now also a small open air restaurant – softies would have been a most welcome and popular drink 32 years previously! Having finished filming the following day, I took a walk down memory lane around “Downtown Aswan” and was pleased to see that little had really changed and that which had was an improvement. The temperature was even hotter than I remembered – 44C - so I spent as little time as possible sightseeing. I did notice however that a considerable number of housing projects had taken place, both in town and at the embarkation site where we caught the boat for the island. A cultural museum has been built containing many artefacts including a model of an ancient village which I found more than a little interesting. The population of Aswan has increased considerably, as has the tourist numbers. This has taken away a little of the old world charm but, nevertheless, it is still a fascinating place to visit and take a holiday with a difference. May said she would like to see it again so last April we spent a week on a Nile cruise and a second week ashore at “Elephantine” island Aswan. We experienced one of the best holidays we have ever had during which we also visited Abu Simbel and attended the son et lumiere performance at Philae. I felt very fortunate to have been sent to lift the Diocletian gate all those years ago and was even more glad to have had the opportunity of returning there to see the finished article. Postscript: The resulting TV documentary entitled 'Monster Moves: Rescuing Ramesses', was broadcast on Channel Five on 4 March 2008.